Siemens has developed a low-cost multichannel current measuring system for small and medium-sized companies. The modular system of type 7KT PAC1200 measures the energy consumption of up to 96 consumers and displays the data graphically via a web application. The measured data can also be transferred into existing power monitoring systems. The system was developed for use, for example, in data centers, office buildings, commercial kitchens, and breweries where there are a large number of individual power consumers. Users can easily install the system in the power distribution board and get a fast, uncomplicated means of recording and comparing the energy consumption of all consumers in the company. Accurate time and cost data is also provided. This system makes power consumption transparent and reveals energy guzzlers and avoidable peak loads. As a result, companies can take more specific measures to save energy and thereby save costs. The system is of modular design and can be installed in a space-saving fashion in the power distribution board in a few simple steps. The number of consumers to be measured can be changed by using different sensor bars. 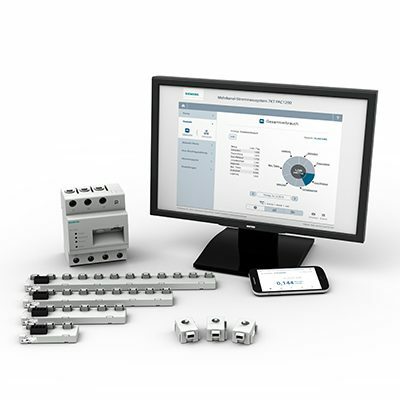 Siemens offers bars with three, six, nine, and twelve sensors. The sensors pick up the measured data direct from the miniature circuit breakers, which are allocated to individual consumers and gather the data in the data manager. Up to eight sensor bars can be connected to one data manager. The measured data are transferred to a web application and analyzed. They are displayed in the web interface as a graphic and as individual values, and at the same time they are converted into costs. This provides users with a highly transparent method of reading energy consumption in kilowatt hours and in euros or Swiss francs. The web application extrapolates the consumption and costs to hourly, daily, weekly, monthly, and annual consumption on the basis of the currently measured data. This allows individual or total values to be easily compared with each other over long periods. The application can be configured according to the user’s specifications and adapted to the requirements of the company. An app available for tablet computers and smartphones offers extremely user-friendly visualization. As a result, companies can quickly and easily obtain an accurate overview of the energy costs they incur, compare values over weeks and months, and identify high levels of consumption.